This Companion brings together a team of leading figures in contemporary philosophy to provide an in-depth exposition and analysis of Quine’s extensive influence across philosophy’s many subfields, highlighting the breadth of his work, and revealing his continued significance today. Gilbert Harman is James S. McDonnell Distinguished University Professor of Philosophy at Princeton University. He has written broadly about W.V.O. 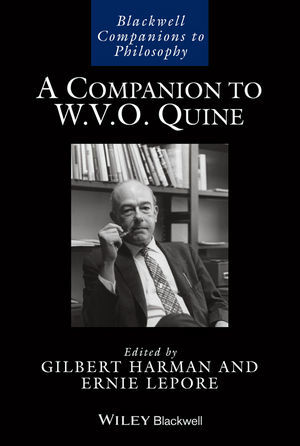 Quine’s philosophy, and much of his research shows Quine’s influence, including Thought (1973), Change in View (1986) and Reasoning, Meaning, and Mind (1999). He is also editor of Semantics of Natural Language (with Donald Davidson, 1970) and The Logic of Grammar (1975). Ernie Lepore is an American philosopher and cognitive scientist. He is currently Acting Director of the Rutgers Center for Cognitive Science, and a professor at Rutgers University. He is the co-author with Herman Cappelen of Insensitive Semantics (Wiley-Blackwell, 2004) and Language Turned on Itself (2007). He is editor of The Oxford Handbook of Philosophy of Language (with Barry C. Smith, 2006) and general editor of the Wiley-Blackwell series Philosophers and Their Critics.